Have you entered my current giveaway yet? 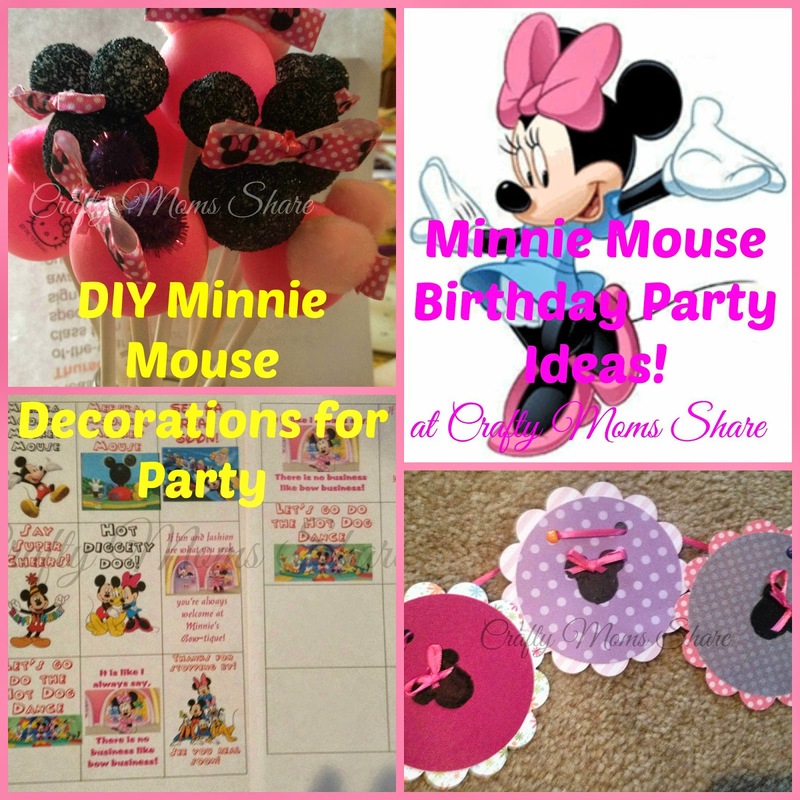 For Hazel's half birthday party, I have some store bought Minnie Mouse decorations and some from Oriental Trading to review that Hazel picked out. However I wanted to keep costs down and make some of our own. 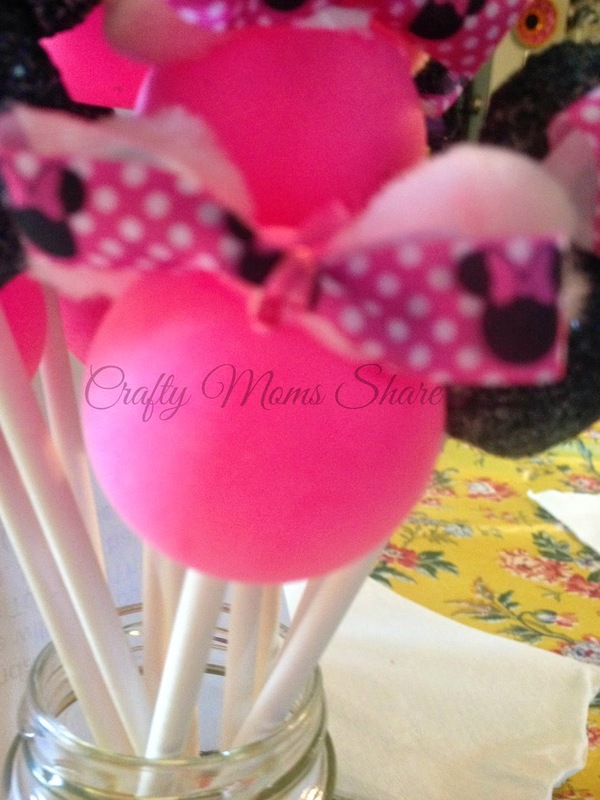 I have seen so many fun ideas on line and have been pinning them to my Minnie Mouse Party Pinterest Board. 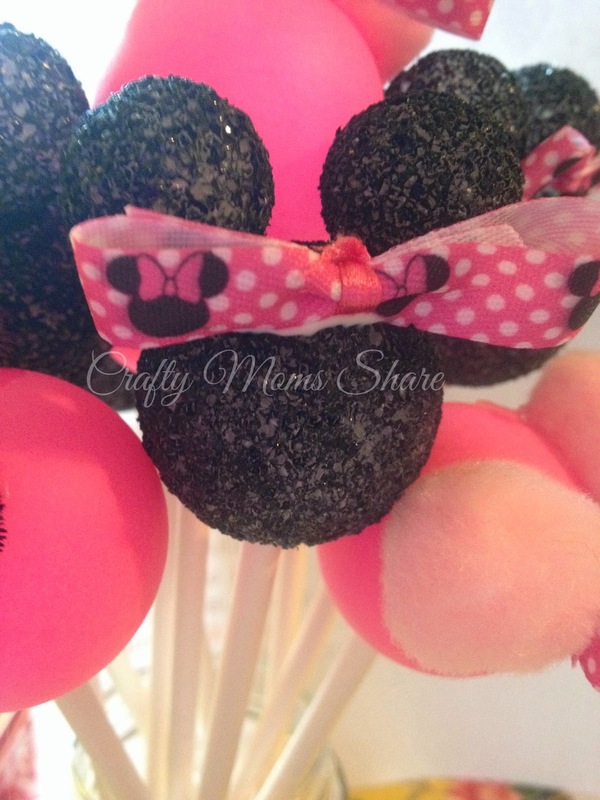 I loved the idea of making Minnie head decorations from styrafoam balls. The first time I saw this was on The NY Melrose Family's Minnie Mouse Centerpieces. We did this. I glued them and Hazel painted them black. After the paint dried, I stuck a lollipop stick into each one. If we wanted Mickey Mouse, we would stop here. However Hazel wants Minnie Mouse, so I made some bows and glued them on. We also made some from pink ping pong balls. I found a pack of Hello Kitty pink ping pong balls. We used pom poms for the ears. Hazel helped me make these. After the glue dried I cut a hole in the bottoms and stuck the lollipop sticks in. 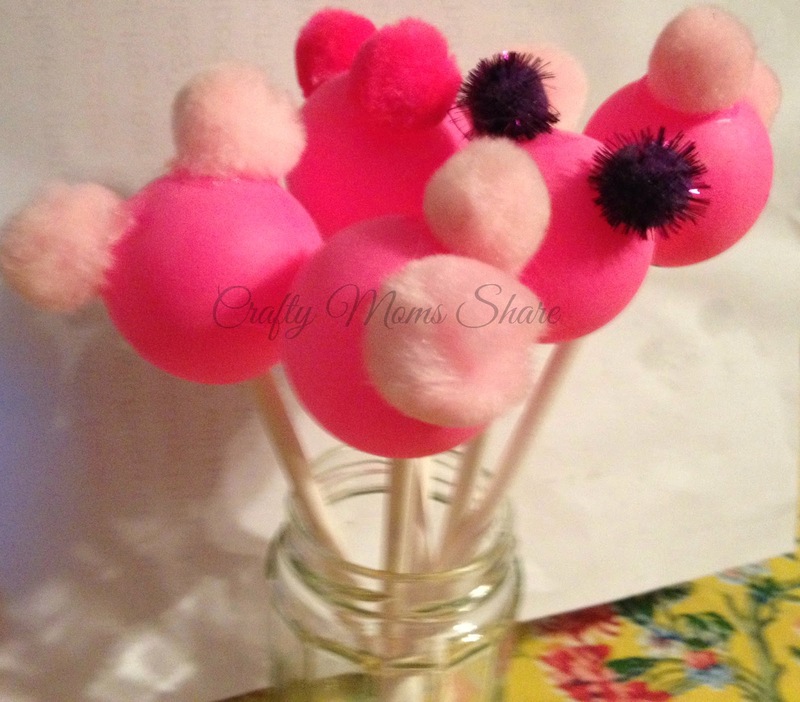 We played around with the color of the pom poms. Again for Mickey we could stop here (and probably would have done a color besides pink). We are doing Minnie though and added bows as well. I have them all together in a jar for now, but plan to stick them in different things just to help add the Minnie Mouse theme. 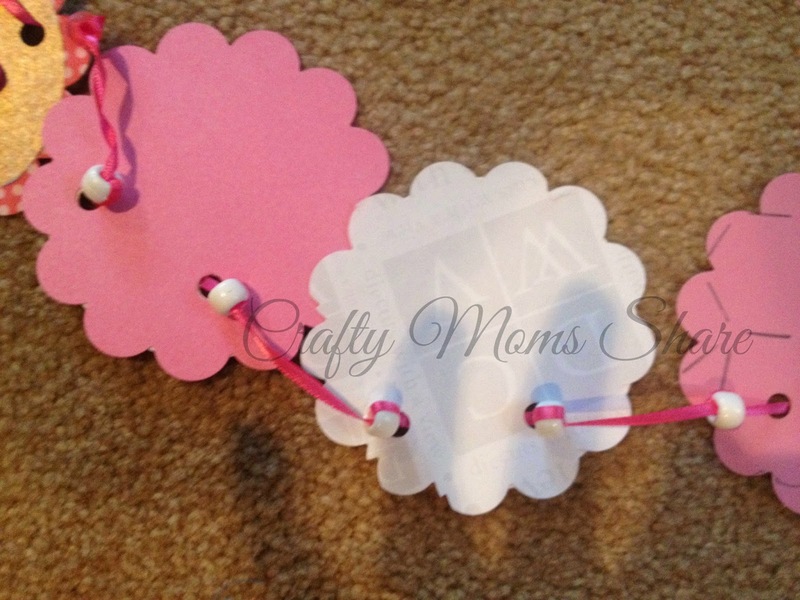 Another simple DIY decoration we made is a garland. 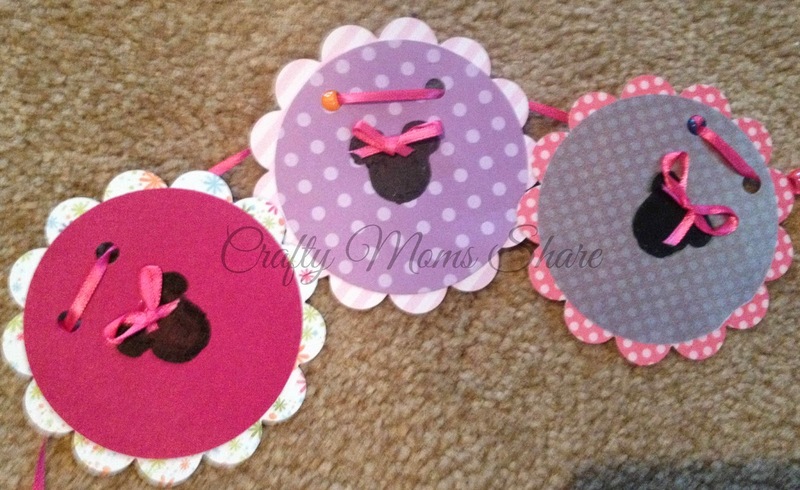 To do this I used scrapbook paper and punches. 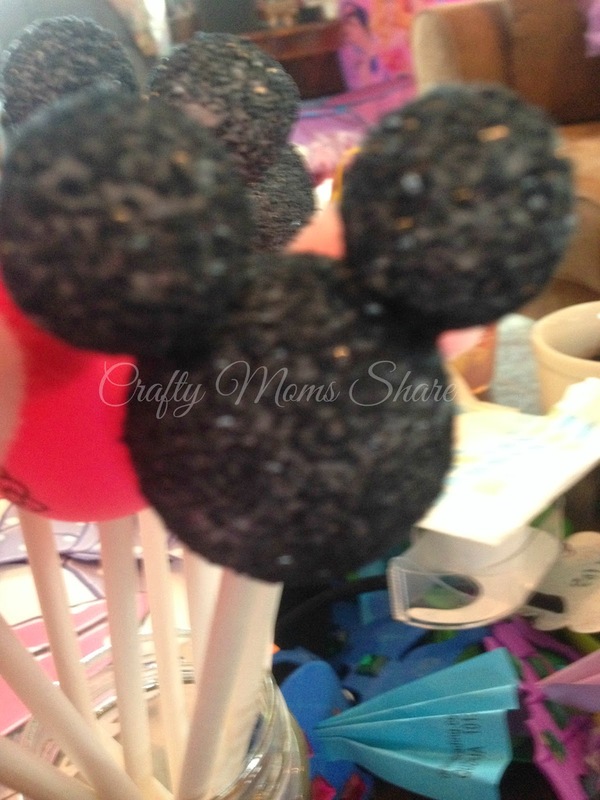 I used a scalloped punch, a 3-inch circle punch and I tried to use a Mickey Mouse punch. I used two Mickey Mouse punches and only was able to get one Mickey punched out of computer paper. Then they just would not go down enough to punch. I figured after two defective ones to give up. I used the hole of the one punch I got as a template and used a black paint marker to color the head on the circles. Then I added a bow. I strung them with a ribbon and I put beads in the back of each hole so they will not all gather in one spot. I put the end of the ribbon through the bead in both directions to "tie" a knot to keep the bead in place. I will hang them on the stairs next to the patio probably. I like how it came out. If you do not have the punches to make this, there are some free printable garlands floating around on-line as well. 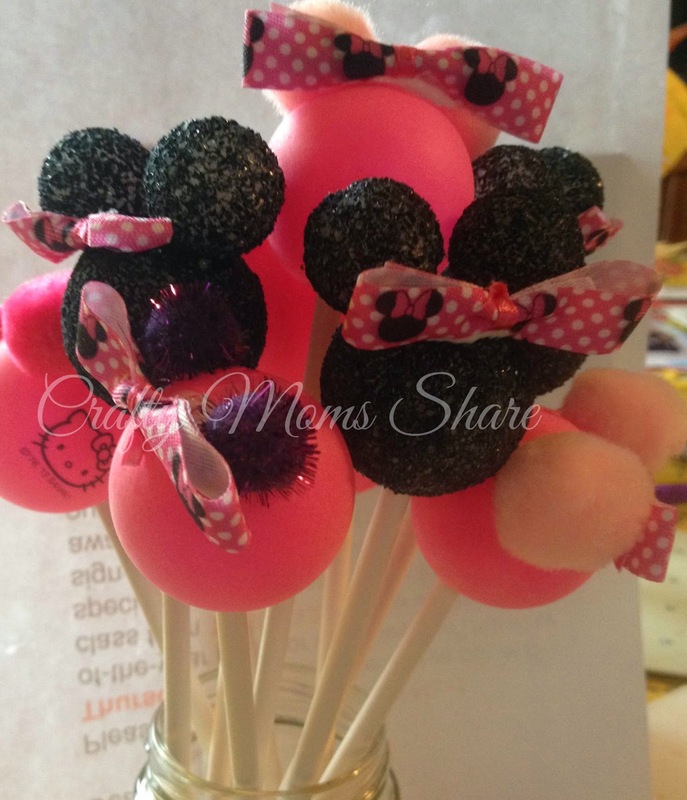 Here are two I found at Peonies & Poppy Seeds: Minnie Mouse Bowtique Birthday Banner and Minnie Mouse Bowtique Birthday Printables. 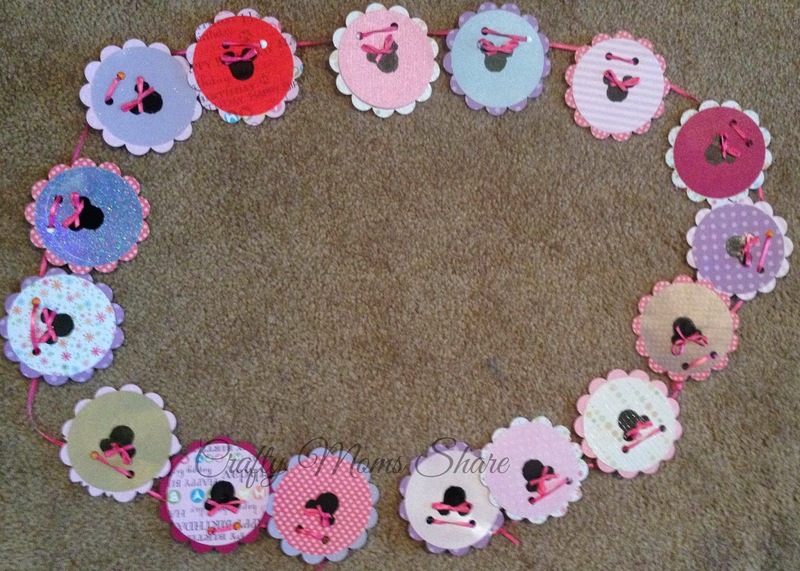 I still need to make the Hazel's Bow-tique Sign I saw on The Lovebugs Blog: Lovebug's Bow-tique Birthday Party. 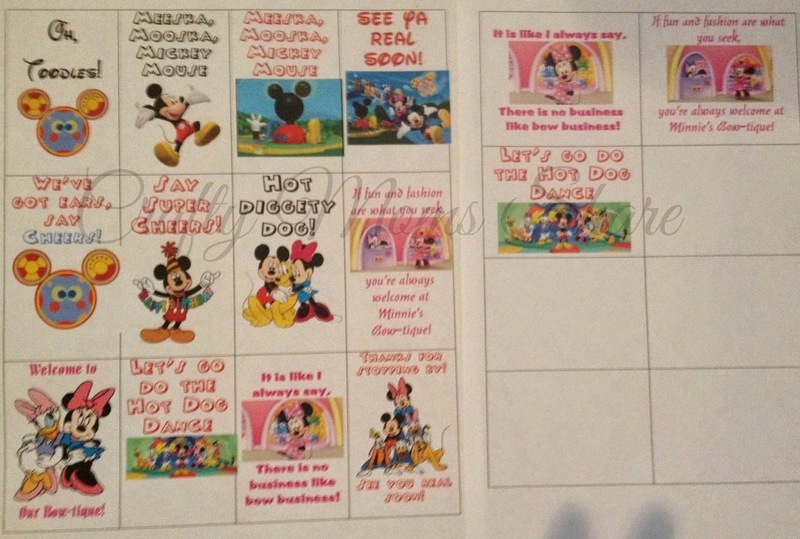 She provides some of the printables in jpg form so you can adjust them and personalize it. Finally I bought some of those small frames (think placecard frames) at Michaels on clearance and I made a few of the Mickey Mouse Clubhouse and Minnie Bow Toons sayings with pictures to put in them. Here is what I came up with and if you want to download it, click on the picture.